If you’re celebrating with the regular crowd, by now you know who brings which dishes (Mom’s special cheesy potatoes, Aunt Sue’s famous pumpkin pie) so start thinking about what you’re planning on eating, or avoiding. 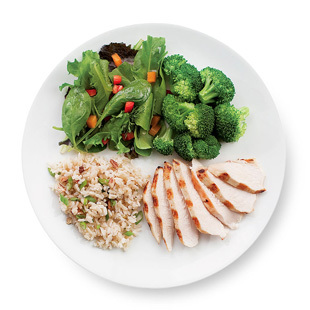 This is how you should break it down: each meal you want a protein, a good carb, and a veggie. Thanksgiving is no different. Protein source: Turkey. Vegetarian? Try cooking your own protein substitute for dinner. Look out for added ingredients such as sugar, butter, bread crumbs, and sauces. While no one is expecting you to eat 100% clean on Thanksgiving—you should have a piece of pumpkin pie—you shouldn’t go crazy like it’s your last meal. Once again, it comes down to planning. Pick one dessert you are going to eat, not three. There may be a lot of choices, and they all will look yummy, but as they say, “a moment on the lips, a lifetime on the hips”. It will only taste good for a moment, but you will regret eating it a lot longer than that, so eat a dessert you’ll munch slowly and savor. Take a walk after dinner, or go for a run. You’ll feel great, and it will get you out of the house and away from the all the goodies. Watching what you eat can be a dangerous thing around family members. “You don’t need to watch what you eat,” or “Aren’t you going to try my___?” These may be some of the things you’ll hear at the table, and you may even catch a few dirty looks, but you can kindly tell them that this is your personal choice, and explain to them why you’ve decided to make the choices you have. It may be a learning experience for them. It may be crowded at the gym the day after Thanksgiving, but it’s worth it. Getting back on track immediately will keep you from falling off the workout wagon. Too packed in the gym for a workout? Take it outside. Plan an outdoor workout including lots of plyo and cardio to help burn off any treats you might have consumed. This workout will have you feeling great after Thanksgiving Day, and all you need is a mat and your gym attire. To support your major cardio refresh, we suggest trying one of the following L-Carnitine products to up your performance and blast fat. Information Provided by Muscle & Fitness. Please visit their website for more articles on health, nutrition and fitness.